William Parker, 4th Baron Monteagle. Attributed to John de Critz, c.1615. John de Critz or John Decritz (1551/2 – 14 March 1642 (buried)) was one of a number of painters of Flemish and Dutch origin active at the English royal court during the reigns of James I of England and Charles I of England. He held the post of Serjeant Painter to the king from 1603, at first jointly with Leonard Fryer and from 1610 jointly with Robert Peake the Elder. De Critz was born in Antwerp. His Flemish parents brought him as a boy to England from Antwerp, during the Habsburg persecution of Dutch Protestants, and apprenticed him to the artist and poet Lucas de Heere, also from Antwerp, who may have taught members of the Gheeraerts family and Robert Peake as well. De Critz established himself as an independent artist by the late 1590s,  and in 1603 he was appointed serjeant-painter to the king. De Critz's work, traced through his bills, also entailed the restoration of decorative detail, the painting and guilding of royal coaches and barges, and individual tasks such as painting the signs and letters on a royal sun-dial. He also painted "bravely" for court masques, dramatic spectaculars which required elaborate scenery and scenic effects. De Critz's father was Troilus de Critz, a goldsmith from Antwerp. John de Critz's sister Magdalena married Marcus Gheeraerts the Younger, another Flemish court painter, who may also have been a pupil of de Heere. De Critz was succeeded as Serjeant Painter by his son John the Younger (b. before 1599), who had been involved in the work for many years—his father died at about 90. John the Younger was killed shortly afterwards in the fighting at Oxford. Other painters from the family include John the Elder's sons Emmanuel (1608–65), who also worked for the court, and Thomas (1607–53), to whom many portraits of their Tradescant relations are now attributed. Thomas also worked for the Crown between 1629 and 1637. Oliver de Critz (1626–51) was a son of John the Younger by his third wife; his portrait in the Ashmolean Museum may be a self-portrait. The post of serjeant-painter came into being with the appointment of John Browne in 1511–12, and the last known holder was James Stewart, of whom no records are available after 1782, though it is not clear whether the post was ever actually abolished. In a patent issued on 7 May 1679 for Robert Streater, a list of previous serjeant-painters is given, including "John Decreetz & Robert Peake" as joint-holders of the post. De Critz was given the post in 1603 but is first described as sharing the office with Leonard Fryer, who had held it since 1595. Robert Peake the Elder was appointed jointly with de Critz in 1607, or 1610. A payment made to de Critz in 1633 shows that he was paid a retainer of £40 a year. For three portraitss made in 1606, of the King, Prince Henry, and Anne of Denmark, to be sent to the ambassador in Austria, de Critz was paid £53 six shillings and eight pence. Anne of Denmark. John de Critz, c.1605. The role of the serjeant painter was elastic in its definition of duties: it involved not just the painting of original portraits but of their reproductions in new versions, to be sent to other courts (King James, unlike Elizabeth, was markedly averse to sitting for his portrait) as well as copying and restoring portraits by other painters in the royal collection, and many decorative tasks, for example scene painting and the painting of banners. For several times oyling and laying with fayre white a stone for a sun-dyall opposite to some part of the king and queen’s lodgings, the lines thereof being drawn in severall colours, the letters directing to the bowers guilded with fine gould, as alsoe the glory, and a scrowle guilded with fine gould, whereon the number and figures specifying the planetary howers are inscribed; likewise certain letters drawne in black informing in what part of the compasse the sun at any time there shining shall be resident; the whole worke being circumferenced with a frett painted in a manner of a stone one, the compleat measure of the whole being six foote. John De Critz demaundeth allowance for these parcells of Worke following, viz. For repayreing, refreshing, washing and varnishing the whole body of his Majesty’s privy barge, and mending with fine gould and faire colours many and divers parts thereof, as about the chaire of state, the doores, and most of the antiques about the windowes, that had bene galled and defaced, the two figures at the entrance being most new coloured and painted, the Mercury and the lion that are fixed to the sternes of this and the row barge being in several places repayred both with gould and colours, as also the taffarils on the top of the barge in many parts guilded and strowed with fayre byse. The two figures of Justice and Fortitude most an end [sic] being quite new painted and guilded. The border on the outside of the bulk being new layd with faire white and trayled over with greene according to the custom heretofore—and for baying and colouring the whole number of the oares for the row barge being thirty-six. John de Critz's final bill for painting these barges and their carvings by Maximilian Colt in 1621 was over £255. Walpole also noted that de Critz painted a gilded "middle piece" for a ceiling at Oatlands Palace and repaired pictures, and he quoted a wardrobe account for work on the royal carriages: "To John De Critz, serjeant-painter, for painting and gilding with good gold the body and carriages of two coaches and the carriage of one chariot and other necessaries, 179l.3s.4d. anno 1634." De Critz also gilded Maximilian Colt's marble effigy for the tomb of Elizabeth I, completed in 1606, which had been painted by Nicholas Hilliard. All traces of the painting and gilding have now disappeared. A great deal of easy fun has been poked at the institution of the serjeant-painters, because these had to attend to tasks such as downright house-painting, the painting of barges and coaches, the provision of banners and streamers, and so on. It is not certain in precisely which part of London de Critz had his studio, but it is known that he moved to the parish of St Martin-in-the-Fields before his death in 1642. He stated in his will that he had previously lived for thirty years in the parish of St Andrew, Holborn. Horace Walpole notes George Vertue's comment that there were three rooms full of the king’s pictures at de Critz’s house in Austin-friars. De Critz is entered in a subsidy roll for the parish of St Sepulchre-without-Newgate in 1607 and again in 1625; and since this parish adjoins St Andrew, Holborn, he possibly had his studio in St Sepulchre. He died in London in 1642; the exact date is unknown. To make definitive attributions is a difficult undertaking. This is due to a variety of causes, the most important being the practice of successful painters of employing assistants. Another confusing factor is the tendency on the part of members of the artistic families to intermarry with one another; Marc Gheeraerts the elder and his son and namesake, for example, both married sisters of John de Critz. Similarities of style were also encouraged by legislation, and painters were for a time forbidden to portray the Queen pending the painting of a portrait such as might be taken as a model to be copied. The Somerset House Conference. Painted ?1604. National Portrait Gallery version. Robert Cecil is seated front right. As part of the monarchy's advancement of its political and dynastic aims, numerous copies of standard portraits were required for presentation as gifts and transmission to foreign embassies. Gustav Ungerer has studied the interchanges of portraits, jewellery and other gifts during the negotiations and celebrations which surrounded the Treaty of London, a peace treaty signed with Spain in August 1604 during the conference at Somerset House, when diplomatic exchanges of miniatures and full-length portraits took place in a sustained show of brilliant self-representation. 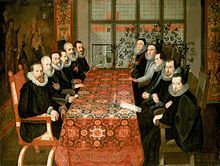 In this context, Ungerer discusses the contested authorship of the famous painting of the two sets of negotiators sitting opposite each other at the conference table, The Somerset House Conference, a work in which John de Critz may have had a hand, either directly or as a source for the copying of figures. Robert Cecil, later 1st earl of Salisbury. Attributed to John de Critz, 1602. Both versions of the painting—one at the National Portrait Gallery and one at the National Maritime Museum, Greenwich—are signed by the Spanish court painter Juan Pantoja de la Cruz; but scholars disagree about whether he was in fact the artist since, although the signatures appear authentic, he was never in London. It is possible that either the works are by a Flemish artist, possibly Frans Pourbus, or John De Critz, or were copied by Pantoja from a Flemish artist who was in London at the time. Pantoja may have worked up the likenesses of the English negotiators by "copying the faces of the delegates either from miniatures or from standard portraits given to him or to the constable in London or sent to Valladolid...He obviously used a Cecil portrait as model for The Somerset House Conference which was Cecil's standard type of portrait attributed to John de Critz". 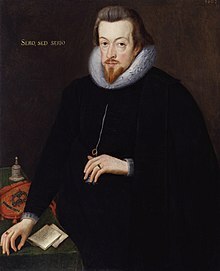 It is certainly on record that the leader of the English negotiating team, Sir Robert Cecil, gave the leader of the Spanish negotiators, Juan Fernández de Velasco, 5th Duke of Frías and Constable of Castile, his stock portrait as duplicated in the workshop of John de Critz. Pantoja's depiction of Charles Howard, earl of Nottingham, also looks as if it has been duplicated from a standard portrait. Apart from the heads, the picture shows signs of workshop painting by assistants, perhaps revealing that numerous versions were produced, as there would have been many demands from those involved for duplicates of the painting, for purposes of historical record. The painting sheds light on the piecemeal process of constructing group portraits at this time. ^ Tate Collection (article on Robert Peake from Grove Art Online). Retrieved 2 June 2007. ^ a b William Gaunt, Court Painting in England from Tudor to Victorian Times, London: Constable, 1980, ISBN 0-09-461870-4; p 53. ^ a b c Horace Walpole, Anecdotes of Painting in England: With Some Account of the Principal Artists, and Notes on other Arts, Collected by the Late George Vertue. Digested and Published from his Original MSS, Vol II. London: Henry. G. Bohn, 1849 edition; p 366. ^ a b Horace Walpole, Anecdotes of Painting in England: With Some Account of the Principal Artists, and Notes on other Arts, Collected by the Late George Vertue. Digested and Published from his Original MSS, Vol II. London: Henry. G. Bohn, 1849 edition; p 365. ^ Some of those in the Ashmolean Museum were attributed to Emmanuel in their 1989 catalogue, and to Thomas in the 2004 edition The Ashmolean Museum: Complete Illustrated Catalogue of Paintings, p. 305, 2006, Catherine Casley, Colin Harrison, Jon Whiteley. ^ Ashmolean Catalogue, p. 266. ^ a b c d "The Serjeant-Painters" (unsigned editorial), in The Burlington Magazine for Connoisseurs, Vol. 84, No. 493, April 1944, p 81. ^ a b c Mary Edmond, "New Light on Jacobean Painters", in The Burlington Magazine, Vol. 118, No. 875, February 1976, pp 74–83. ^ William Gaunt, Court Painting in England from Tudor to Victorian Times, London: Constable, 1980, ISBN 0-09-461870-4; p 52. ^ Alison Weir, Elizabeth the Queen, London: Pimlico, (1998) 1999 edition, ISBN 0-7126-7312-1; p 486. ^ Horace Walpole, Anecdotes of Painting in England: With Some Account of the Principal Artists, and Notes on other Arts, Collected by the Late George Vertue. Digested and Published from his Original MSS, Vol II. London: Henry. G. Bohn, 1849 edition; p 367. ^ John Rothenstein, An Introduction to English Painting, I.B.Tauris, 2001 edition, ISBN 1-86064-678-6; p 25. ^ Gustav Ungerer, "Juan Pantoja de la Cruz and the Circulation of Gifts Between the English and Spanish Courts in 1604/5", in Shakespeare Studies, ed. John Leeds Barroll, Fairleigh Dickinson University Press, 1998. ISBN 0-8386-3782-5; p 145. ^ Notes for the Gilbert Collection exhibition "Talking Peace 1604: The Somerset House Conference Paintings", 20 May 2004 – 20 July 2004. Retrieved 3 June 2007; Gustav Ungerer argues that Pantoja may have visited London with the Spanish delegation. See Gustav Ungerer, "Juan Pantoja de la Cruz and the Circulation of Gifts Between the English and Spanish Courts in 1604/5", in Shakespeare Studies, ed. John Leeds Barroll, Fairleigh Dickinson University Press, 1998. ISBN 0-8386-3782-5. ^ "Notes for the Gilbert Collection exhibition "Talking Peace 1604: The Somerset House Conference Paintings", 20 May 2004 – 20 July 2004". Gilbert-collection.org.uk. Retrieved 23 July 2011. ^ a b Ungerer, p 173. ^ Ungerer, p 154. Pantoja had his studio at Valladolid, then the Spanish royal capital. This page was last edited on 28 March 2019, at 22:03 (UTC).